I swear sometimes this blog writes itself – but on the rare occasion putting together a post can only be compared to pulling teeth! This post is the latter. 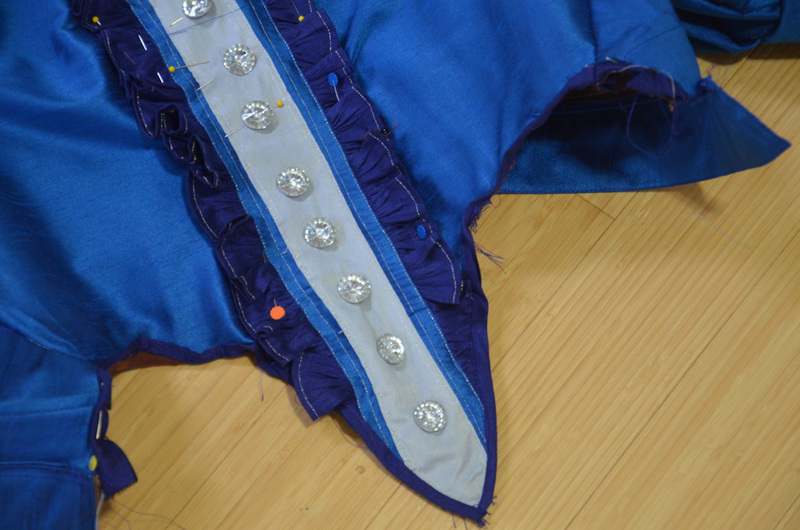 I’m not sure why, but this costume has been absolutely torturous to work on. I really love the design, and though a few bits were challenging, there isn’t anything very difficult about this costume. Despite all this, I haven’t really enjoyed this project…which is sad. 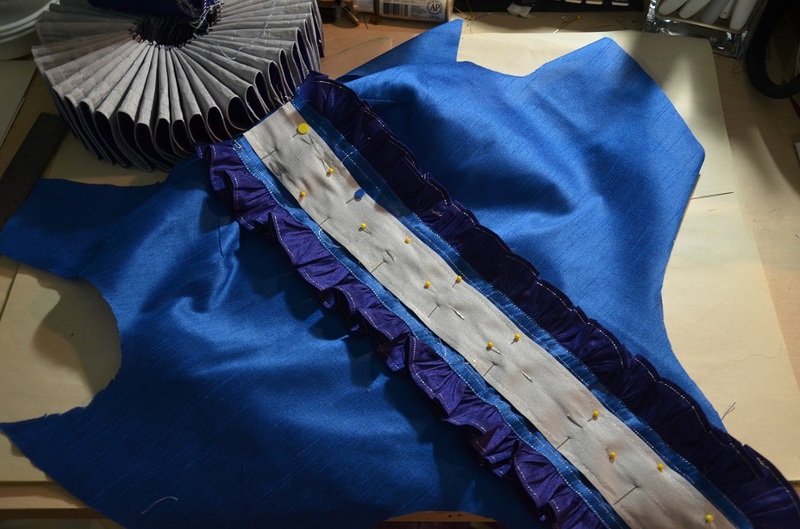 It’s also one of the reasons I haven’t been blogging about it, I haven’t wanted to work on the costume, much less write about it. But now it’s almost complete – and my deadline is only a week away, which means it’s time to get some progress updates. If all goes according to plan another post about this costume should be up within days, then the final post will follow a week or so later. Anyway – onwards! 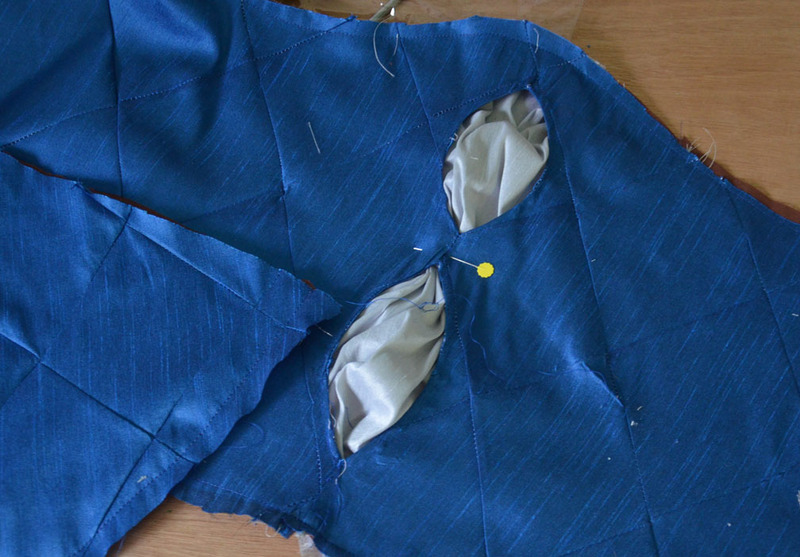 The first post about this costume focuses on the pattern and lining, if you missed this post, it can be found here! So my fabric arrived! This was very exciting, three of the four colors were gorgeous and looked lovely together…sadly the sleeve color didn’t look so good, but I decided it would work (I really, REALLY wanted it to work). This should have been a sign that the sleeves were not going to work out so well. I decided instead of quilting the sleeves I would make them pintucked, which ended up being very time consuming but was easy enough to do. So fast forward a few steps and here is what the “finished” sleeve looked like. It was really awful. It looked really, flat, tacky, lifeless, and CHEAP! 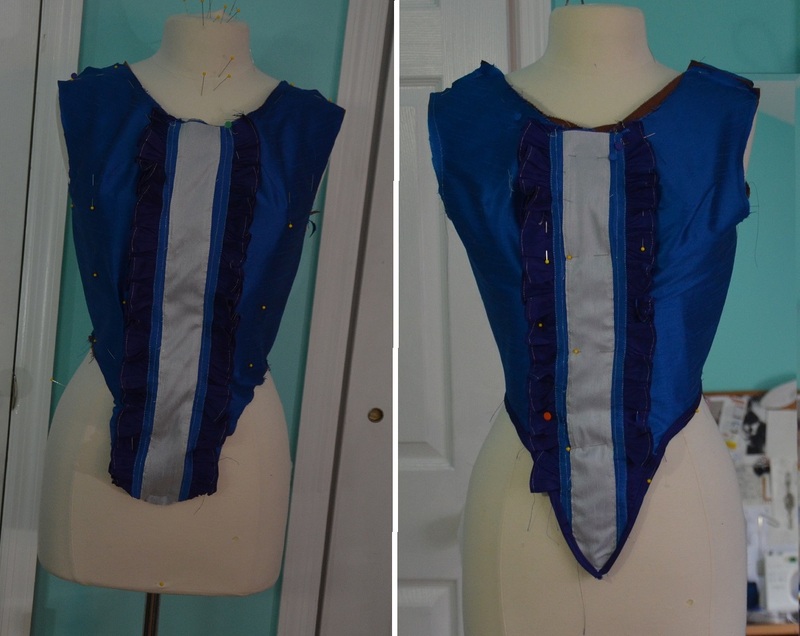 In addition to all that it looked awful with the blue I was using for the bodice. I knew right away it wouldn’t do, so I got working on a new set. 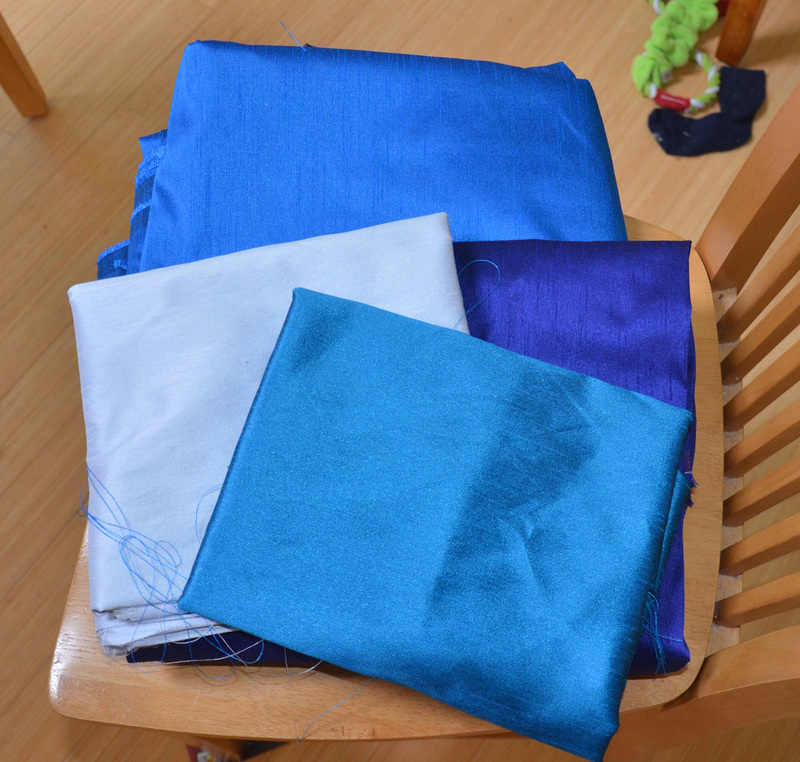 Well, before I could start on a new set, I ordered more material – this time in a lighter shade of blue. I had high hopes this lighter shade would look better with my other materials. Sadly the blue was too light and very green toned. 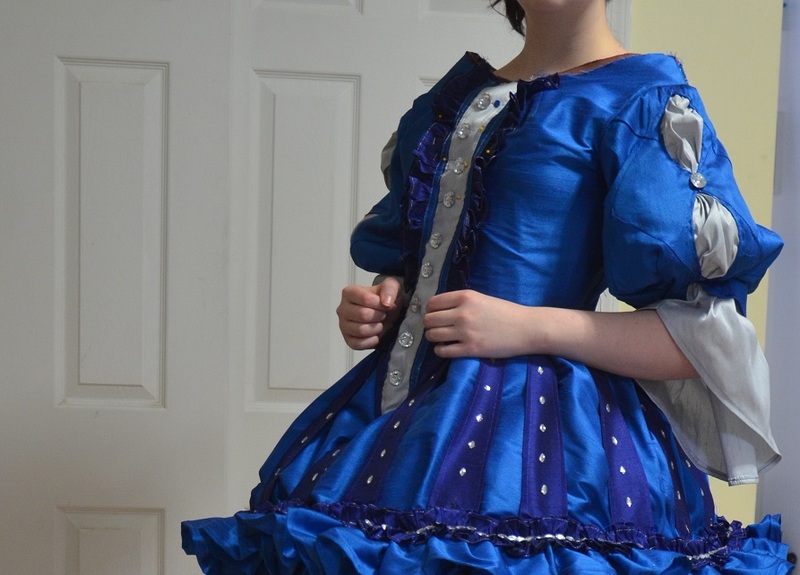 So I said goodbye to accuracy and decided to make the sleeves match the bodice. 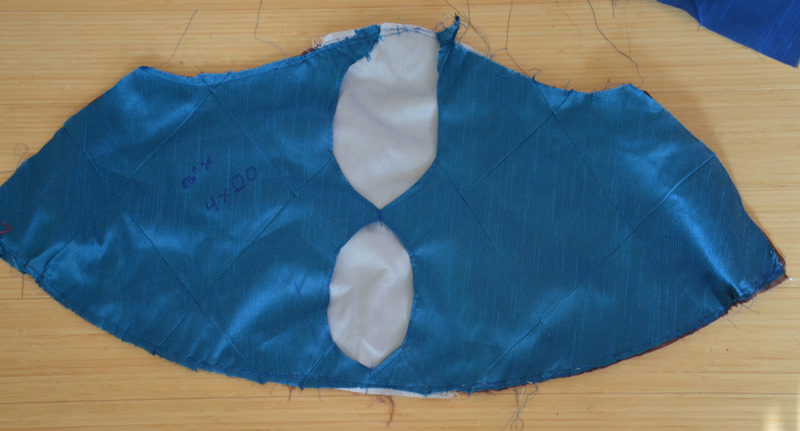 Here is how the pintucks looked all marked out. For the grey center bits I used a rectangle of fabric which was gathered down at the top, bottom, and middle so it looked poofy. I made the sleeve “keyholes” a little smaller. 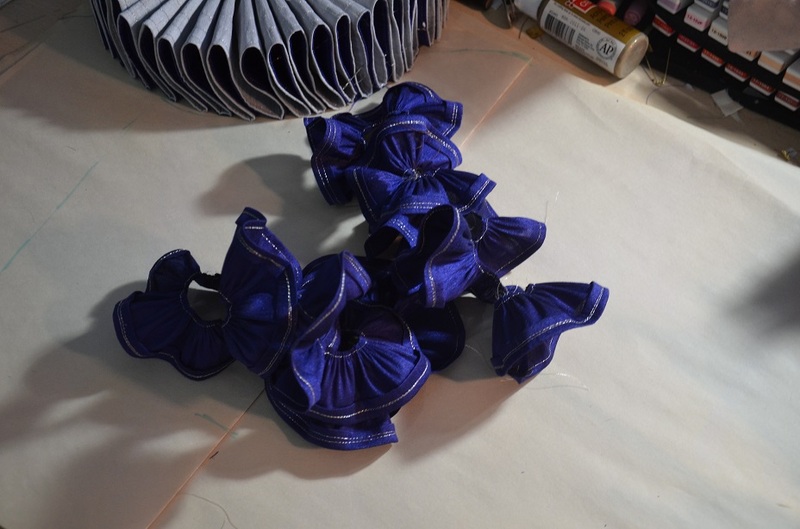 They were also sewn down around the edges so they can’t flare up and show the sleeve base. This time I was much, MUCH happier with how the sleeves looked! They looked fancy an lovely. 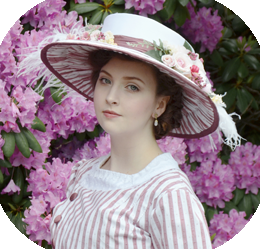 But we have to move away from that for a second to focus on the bodice. There actually isn’t much to this, if you’ve seen the previous post on this you’ll already know the shape and pattern of the top. 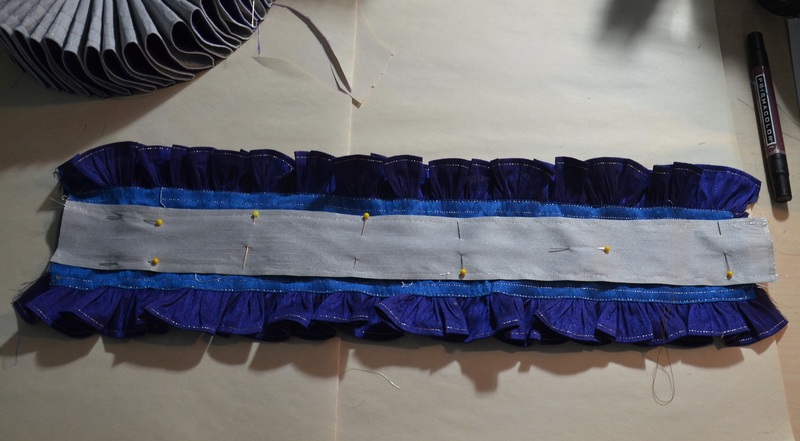 The only “interesting” part of this was making the front ruffle, which consists of several strips of material. 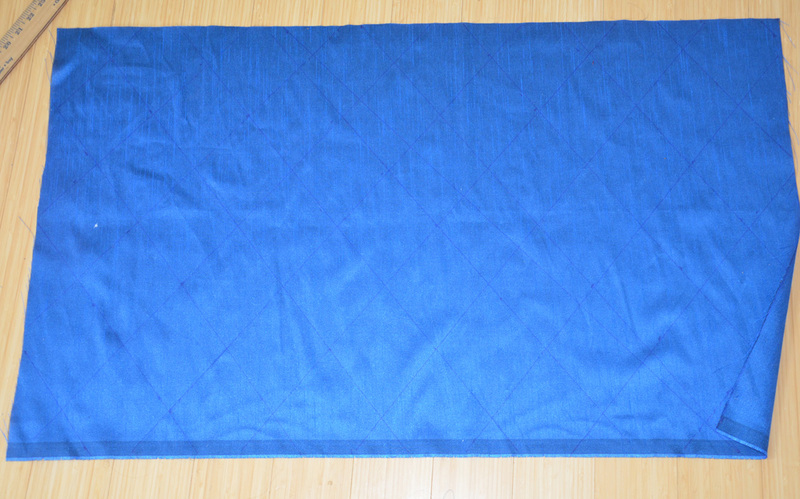 The dark blue ones were double hemmed and gathered by setting the stitch length for 5.0 and the tension at 9. 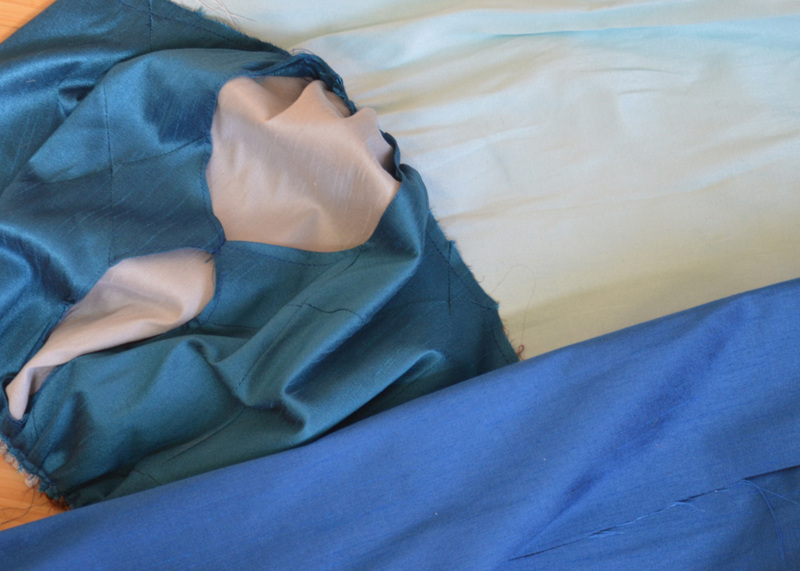 And then the silver piece got sewn into the center of that. 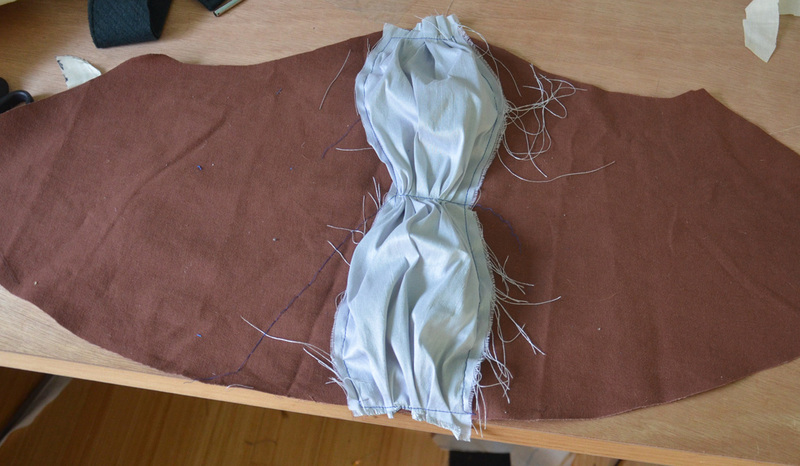 That got sewn onto the bodice. 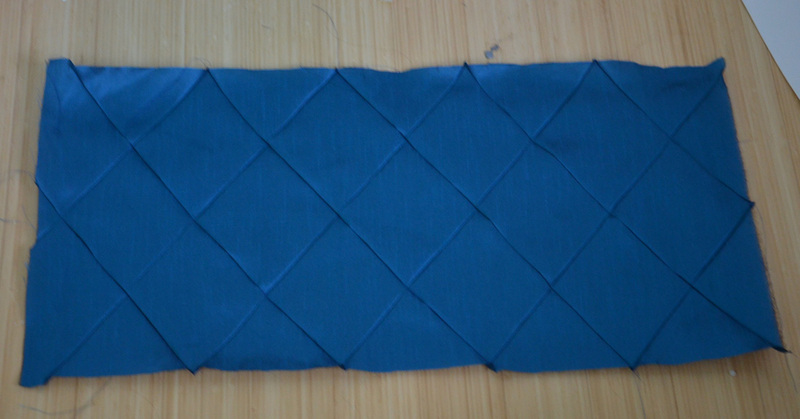 Some time later I cut the bottom into a point and bound the edges with home made bias tape. All this required was some sparkly buttons, which I picked up in a NYC trim shop! 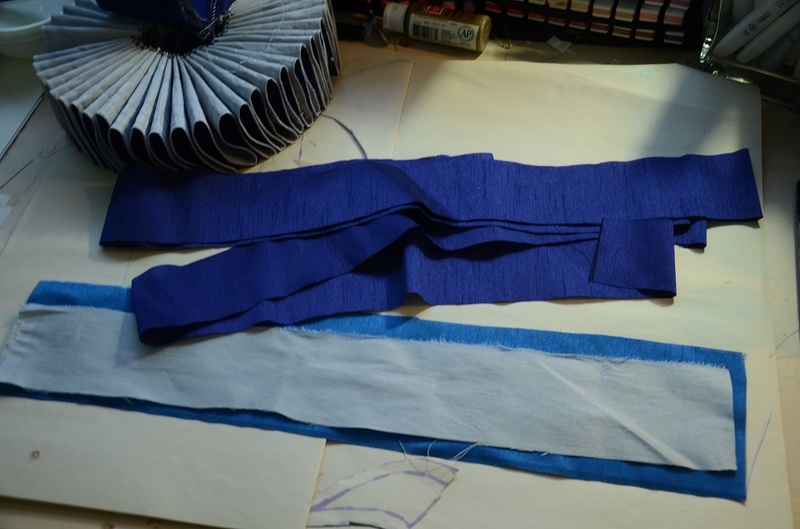 The sleeves got hand gathered and sewn into place, which is pretty self explanatory. 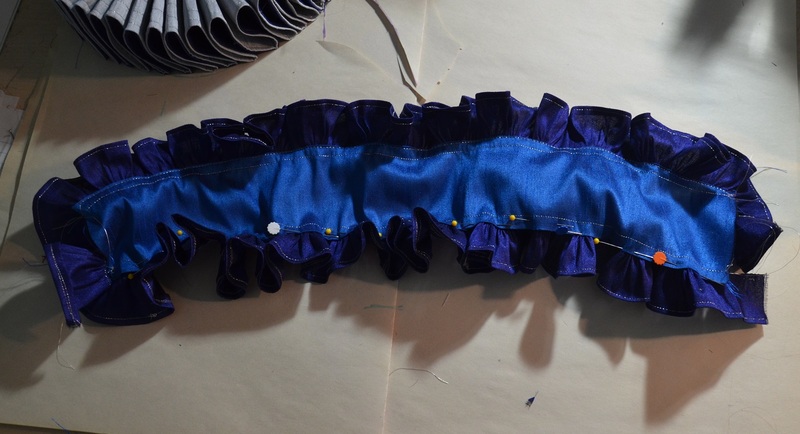 I have to add scalloped trim to the collar, finish sewing on buttons, add a zipper, and maybe add a dart in the shoulder so it fits better; But currently it looks like this! There we go. Only two more posts about this costume to write and i’m done. Anndd as per usual, thank you for reading! I shall have another post up soon.